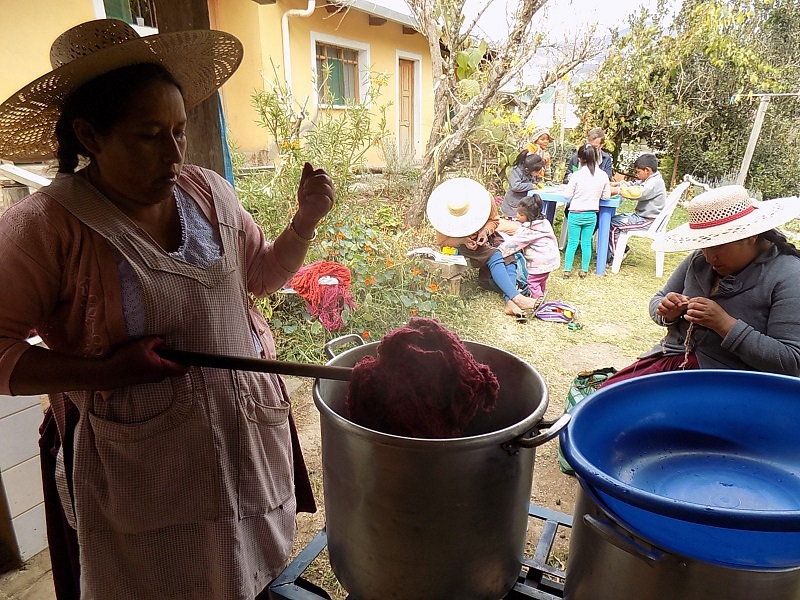 It took the Club de Artesanas (CdA) members two dye days to attend to the pile of hand spun skeins of wool yarn that had been dropped off by the Huancarani weavers. All had requested cochineal tones, which was a good thing because this dry season is unusually dry and there are few local dye plant options. The municipality is rationing water and the hours it is available grow shorter weekly. Multiple containers were filled in the early mornings to handle the rinsing of the dyed skeins. Because both stovetop burners were not in use it was decided to premordant some of the skeins. On the first dye day alum was the premordant and on the 2nd dye day copper sulfate was used to dye the first batch of skeins a dark burgundy. There is something very satisfying about watching a clothesline full of newly dyed skeins drip drying. 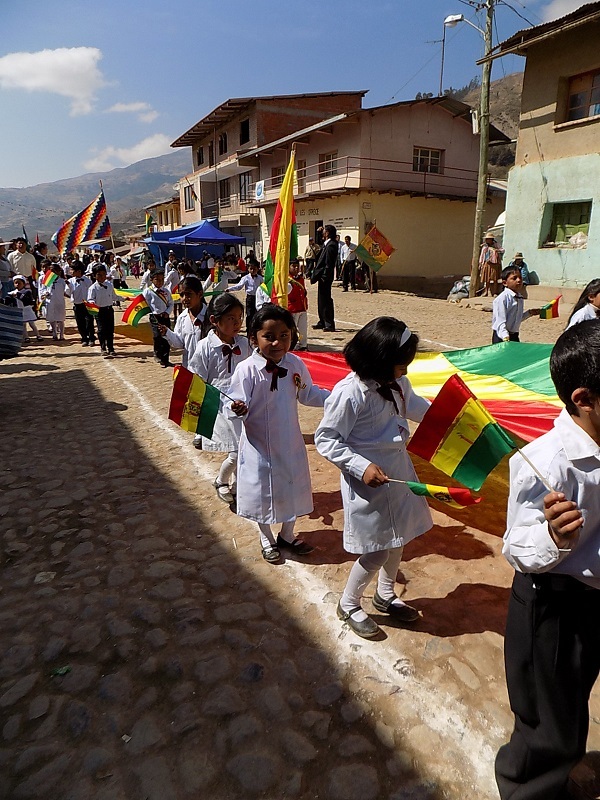 Amy Booth played hooky from her volunteer work in Cochabamba with Performing Life Bolivia to volunteer in Independencia for a week. She enjoys lace knitting, so Lynne Watterson’s book, “The Very Easy Guide to Lace Knitting” which Dorinda’s Aunt Laura had mailed to the CdA years ago finally came off the shelf. It is now looking much used and loved. Amy worked with the women to knit a variety of samples from the book, and then they all trooped off to a local yarn store so the women could buy yarn to make sleeveless tops using their preferred stitches from the samples. 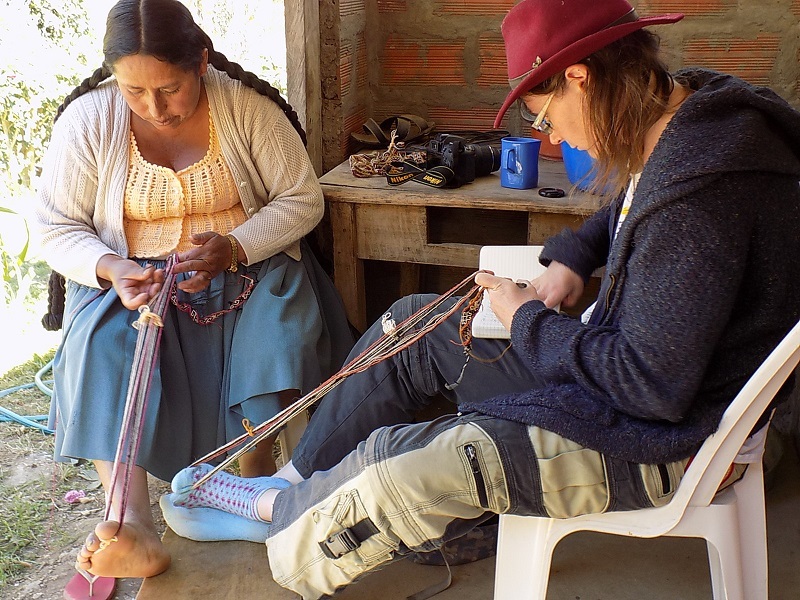 Amy squeezed in 3 weaving classes with Doña Maxima and worked diligently into the wee hours completing her homework. 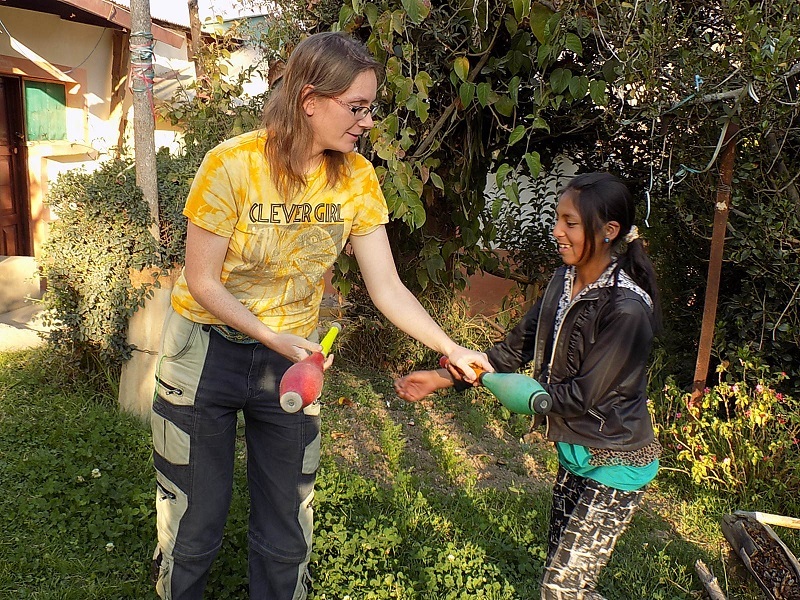 Although Amy had packed light for her week-long stay, she´d brought along 3 juggling clubs. John Connell, the founder of Performing Life, and volunteers teach circus skills to street kids. The kids use the skills to earn money by juggling at intersections around Cochabamba. The program is expanding to include aerial silks and trapeze and classes will be available for a fee to help subsidize the organization´s other programs. Amy is the second PAZA volunteer who spent years of her youth in a circus training program in London. 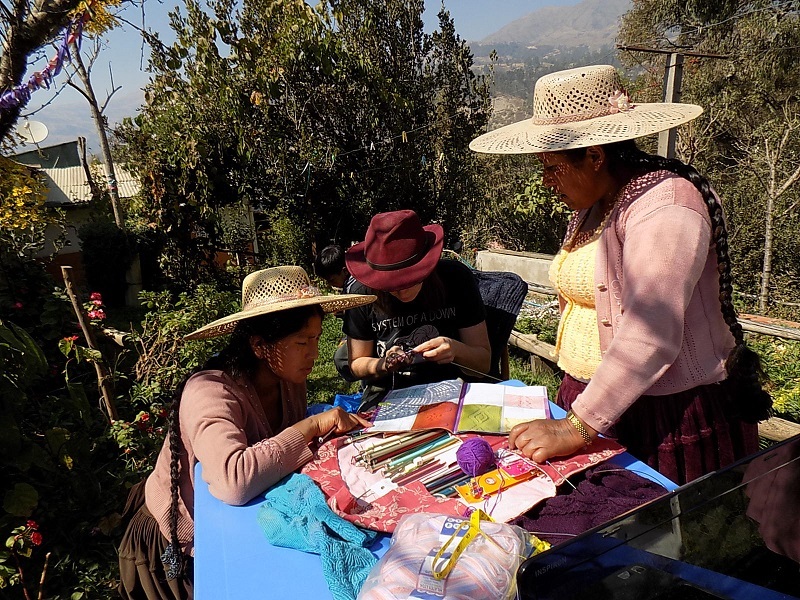 She found out about Performing Life and PAZA through Sustainable Bolivia, a U.S. foundation in Cochabamba that has supported PAZA´s volunteer program and sales of the weavings since 2010. August 6th, is Independence Day in Bolivia and the festivities kick off with a lantern parade the night before. A number of the CdA kids took advantage of the Club’s supplies to make their candle lit lanterns. Luckily, it was a lantern parade because the town’s electricity went off just as the parade started and didn´t resume until a few hours after it ended. The flaming “2016” sign of the graduating class was spectacular, as were the stars on the dark walk home. Everybody was dressed in their best for the official parade on August 6th. Volunteer Joey Hentzler arrived on the bus from Cochabamba during the parade and had no trouble finding Amy and Dorinda in the crowd. 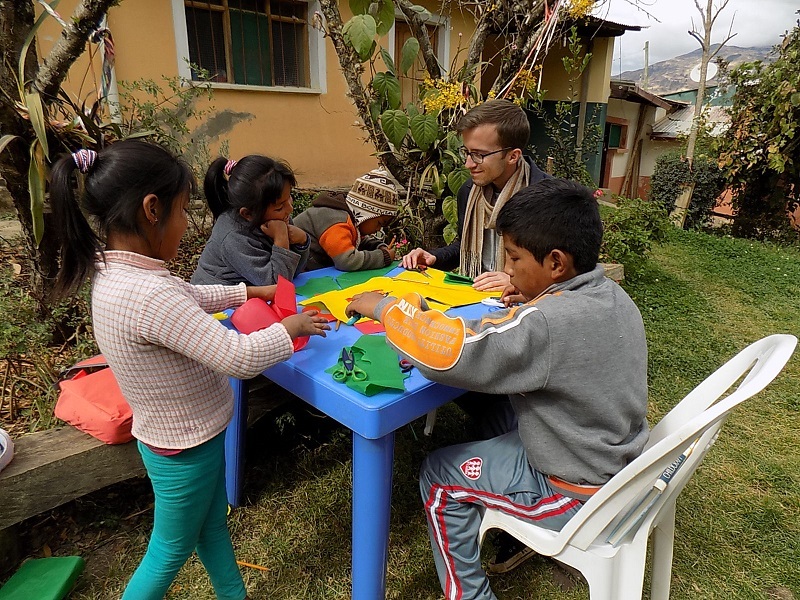 Joey worked with the CdA kids teaching them about Día de los Muertos traditions in Mexico. They also used up leftover tissue paper from lantern making to make paper cutouts that were taped to string like prayer flags and taken home to decorate empty walls. Alas, CdA trainer and weaver, Doña Maxima, was not sitting on pins and needles waiting to update Dorinda on 3-1/2 months of local gossip. In fact, local news is rarely related unless a topic is brought up that triggers a story. It was a bit of a shock while trolling for recent news to hear 2 year old scoop! While discussing the lack of retention of new CdA members, Doña Máxima said a member lasted only 1 year because her husband told her traditional weaving is something that only poor women do! It shouldn´t be a surprise considering that as rapidly changing rural Bolivia “progresses” the locals who now think of themselves as “modern” would spurn anything that might connect them with being old-fashioned. Doña Máxima didn´t appear disturbed about the attitude, her expression conveyed, “what idiots.” She did say that the CdA would probably be more successful in teaching weaving to young teens who live with female relative(s) who are weavers and can help at home. Thank you Dorothy Thursby and Susie Strauss for your ongoing support of the PAZA activities. Thank you George Dutcher for your contribution to the soap making project. The smelly chore of rendering a mix of beef and sheep fat was done last week so the CdA members will be making lovely scented milled soap in the weeks ahead. ← July, Back in Independencia!